breathtaking history and tradition. Visit the charming town of Gion. Gion and Kyoto is filled with emotion, history and culture that charms the world. From Yasaka Shrine to Kiyomizu Temple, there are not only a great number of shrines and temples, but also lovely traditional townhouses which have been renovated into modern restaurants and shops but still continue to keep the traditions they started with. Just as the Gion Festival is representative of the summer, Kyoto has a traditional event for each and every season of the year. None of these events should be missed out on – please endeavor to visit Kyoto throughout the year to experience how Kyoto / Gion changes with the seasons. Words alone cannot describe the charm of these events – it is something that needs to be experienced in person! To Kyoto, elegant and timeless. Enjoy Kyoto to your hearts content! Leave your luggage behind and go sightseeing! JR Kyoto station is only ten minutes by car from the hotel. Please allow us to inform you on the convenient services that allow guests to travel light when walking about the city. “Carrier Service”: Go down to the first basement floor via the escalators in front of the ticket barriers at the central exit (front) of Kyoto station. Take the passage to the right and the service will be right in front of the subway central exit. “Delivery Service”: Located on your left-hand side when exiting the bullet train, via the Hachijo exit or Hachijo East exit. 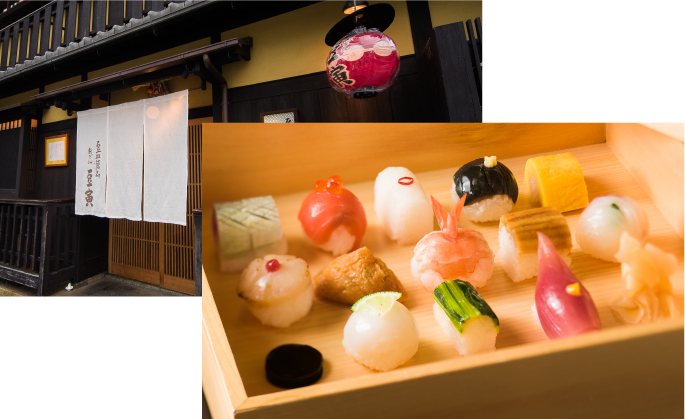 A lunch that appeals to all five senses, where you can taste the past and present of Kyoto. Enjoy lunch at a restaurant along the cobbled street of Hanami-koji, an area filled with the air of Kyoto. Please use all five senses as you feast your eyes on traditional townhouses that have been renovated into elegant and modern spaces, fused uniquely together with stylish, beautiful and tasty traditional Kyoto cuisine such as Mamesushizen, etc. 570-235 Minamigawa, Gion Town, Higashiyama Ward, Kyoto City. Forget about time in the four gardens here – there is “Daiyoen Garden”, a dry landscape garden with white sands dotted with moss and huge rocks, the “Circle, Triangle, Square Garden” which encompasses the four ideas of Buddhism (earth, water, fire, air), the “Hojo Garden”, and the “Cho-ontei Garden” (Garden of the Sound of the Tide). Each of the gardens have such unique characteristics and are so deeply charming that you simply cannot help but look. 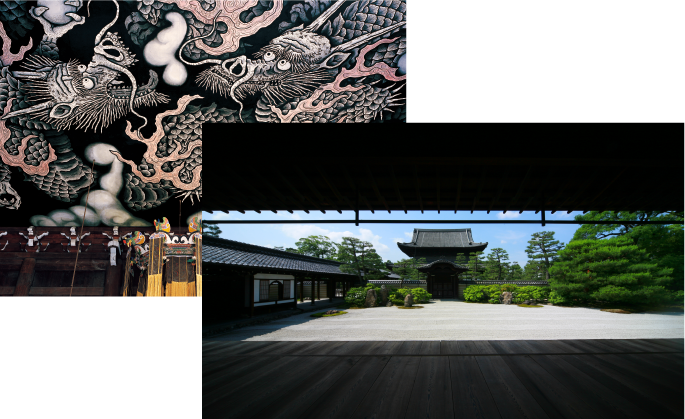 The “Painting of the Two Dragons” is a dynamic ink painting which spans across 108 tatami mats, and is located on the ceiling of the Hatto Hall. It is a painting that was commissioned by the Kenninji Temple Foundation in 2001 to celebrate the 800th anniversary of the temple. It took around two years for the Japanese painter Junsaku Koizumi, who was over 70 years old at the time, to complete the painting. Koizumi sadly passed away in 2012. A masterpiece created by Korin Ogata and Hoitsu Sakai, it was modeled after the national treasure created by Sotatsu Tawaraya. The spatial expression that uses gold leaves really is the highlight of the piece. The original is currently being entrusted to the Kyoto National Museum, so a high-definition reproduction is currently on display at Kenninji Temple. The grand entrance lobby with a height of around 6 meters greets you as you enter through the main entrance of the hotel. Look out the window to see the “Joan Yokei”, a teahouse designed in a modern-way with the theme of a traditional Kyoto Garden. Here, you can experience some Kyoto history and landscape first-hand. 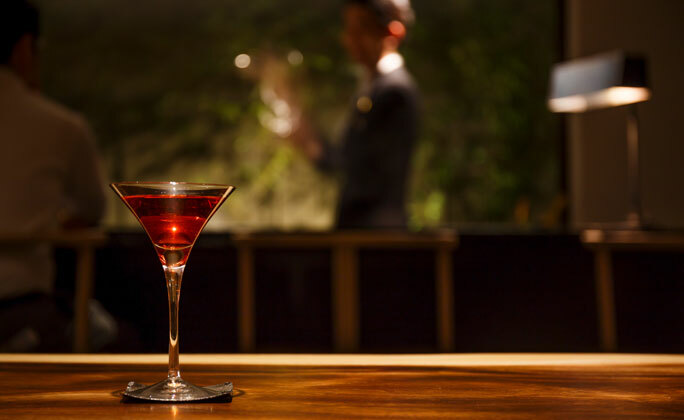 Discover an even more elegant Kyoto from here. Do some Kyoto sightseeing in a slightly different manner by riding a rickshaw! The highly knowledgeable rickshaw men can introduce you to secret Kyoto gems that aren’t listed in any guidebook. Seeing Kyoto from a height may also lead to new discoveries about the area. The rickshaws can pick you up from right outside the hotel. 58-9 Yugyomae-cho,Otani-maeKita-iru,Gojo-hashi Higashi,Higashiyama Ward, Kyoto City. Enjoy your time at the Celestine. 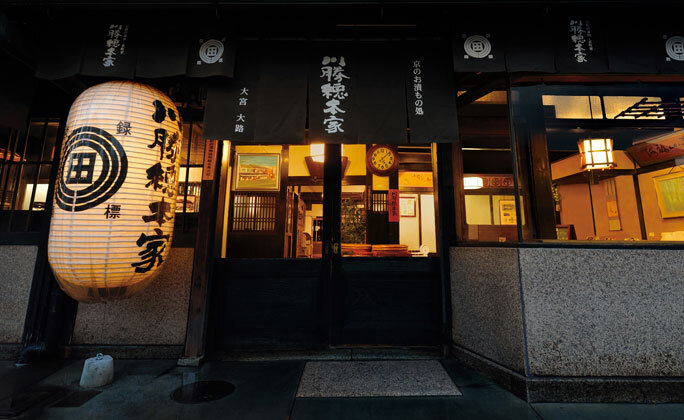 The hotel restaurant is a branch of “Tempura Yasaka Endo”, a well-known and locally loved store where you can feel the history of Gion, Kyoto. The restaurant makes dishes such as tempura using fresh, seasonal ingredients such as Kyo-yasai (specifically certified vegetable varieties grown in Kyoto), mountain vegetables, and seafood from Wakasa and Akashi. The cuisine can be enjoyed at counter and table seats. Get rid of fatigue with a relaxing bath. The spacious, large public bath on B1F will help to fully recharge your batteries and heal any travel fatigue. 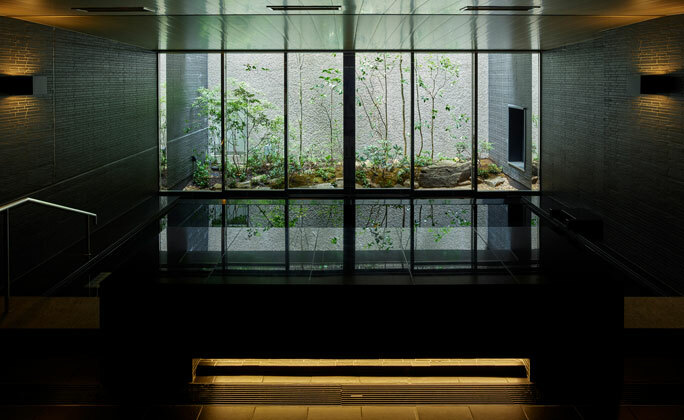 The bath faces the inner garden and is a modern Japanese area shrouded in soft light. Soaking your body in the hot water here will no doubt relax both your mind and body. Please also feel free to use the provided selection of top-quality amenities. Bath towel, shampoo, conditioner, body soap, ion hairdryer, basic cosmetics for women, cotton swabs, water server and weight scales. “Bar Oumie” is a calming, and mature place shrouded in Kurotani washi paper. Why not look back on the events of the day and make plans for tomorrow while making the most of your personal time by drinking here? Sit back and relax and don’t worry about the time! Refreshing mornings in each season. The mornings are always cool and quiet. 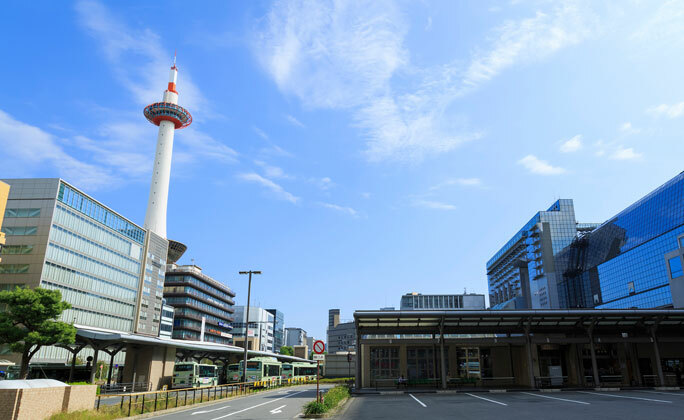 Kamo River is only a six minute walk away from the hotel. On the opposite shore there are stepping stones and benches perfect for taking a break or going for a walk. Enjoy spotting birds such as herons, Japanese wagtails, or seasonal plants at the banks of the glittering river here. Taking a walk in this area is truly a refreshing way to start the day. 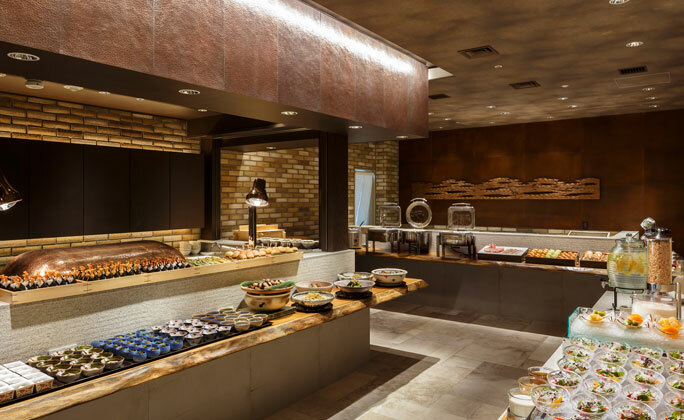 The breakfast is a buffet service provided by restaurant, “Yasaka Endo”. In addition to the classic menu of fresh salad, fruit juice, miso soup, etc., the restaurant also offers “Tempura Endo”, a tempura burger which has been gaining a lot of attention overseas. Don’t forget to try it! 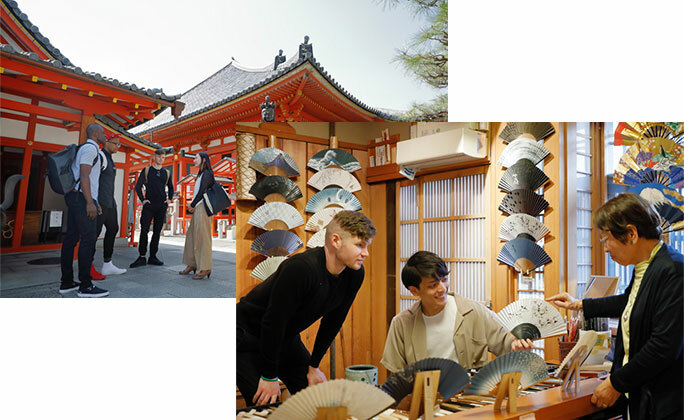 Here, we would like to introduce the tour named “Discover Gion Morning Tour.” This is a tour which only takes about 90 minutes on foot in order to get to know about everything in Gion, with a guide who is so familiar with this area. 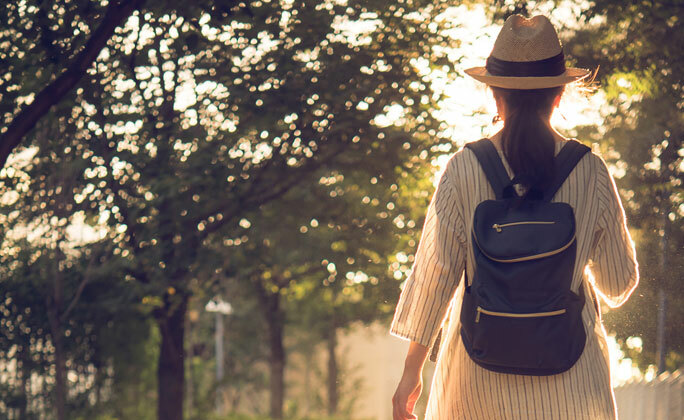 In addition to the famous spots such like Ebisu Shrine and Miyagawa-cho, which possibly gives you an opportunity to meet Maiko or Geiko, we are definitely going to take you to the local areas which are only known for people live in Kyoto.We will provide you local experiences only in gion district. Specifically,you can visit the shop which has many variety of folding fans.Furthermore,you can see the process of how bamboo baskets and tea utensils are made at the Bamboo crafts shop. It must be fun to explore streets which seem too traditional to enter. Before going to the tour, we take a picture of you. At the end of tour, we are going to provide it as a gift with message. Since the tour is given in English, people who have visited Kyoto many times can have a great experience in a new light. 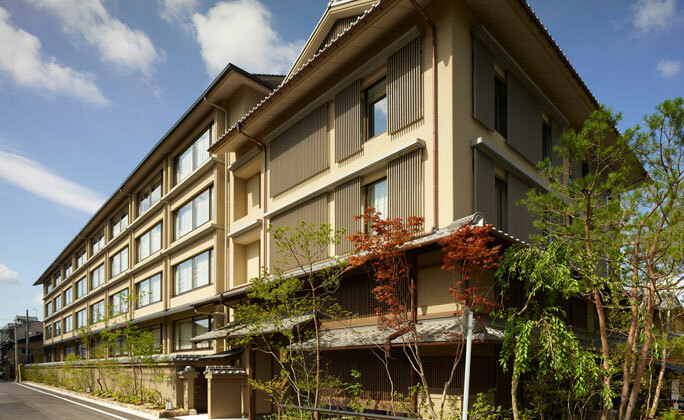 Here again we can assure you that the tour will make wonderful memory　of　your　Kyoto trip and also your stay at HOTEL THE CELESTINE KYOTO GION. We are looking forward to your coming! A lecture by an active artisan from the well-known Kyoto confectionery store which continues to protect over 200 years of tradition. Two types of “nerikiri” (type of unbaked Japanese cake) for each season, as well as “kinton” (mashed sweet potatoes with sweetened chestnuts) are made by hand. 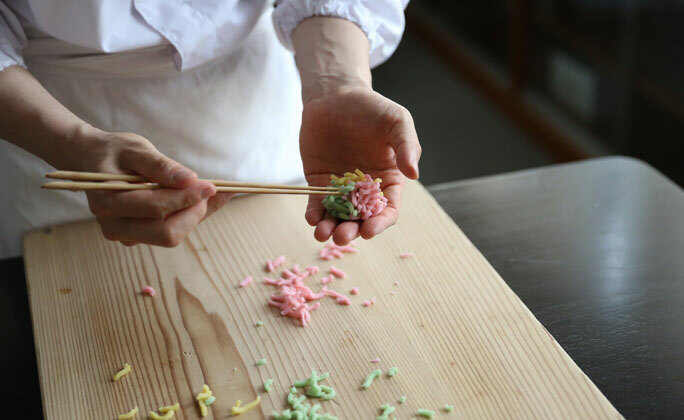 Observe a demonstration of Higashi (dry Japanese candy), and then a tasting session. Reserve in advance by telephone, fax, email or via the application form. Learn how to make Nukazuke (pickles made in rice bran) with your family from the well-known Kyoto pickles store, established in 1917. The store is full of unique knowledge and lavish ideas as they instruct. Heldonbeginning of January~ mid-June, and then mid-August ~ mid-November. Not held during Sundays, public holidays or Obon (mid-August festival which dates change every year. )Reservations are required and have to be made at least a week in advance. “Kyo-no-chaan” – Matcha experience The well-known Uji tea store “Fukujuen”, has also been made famous by their Iemons. 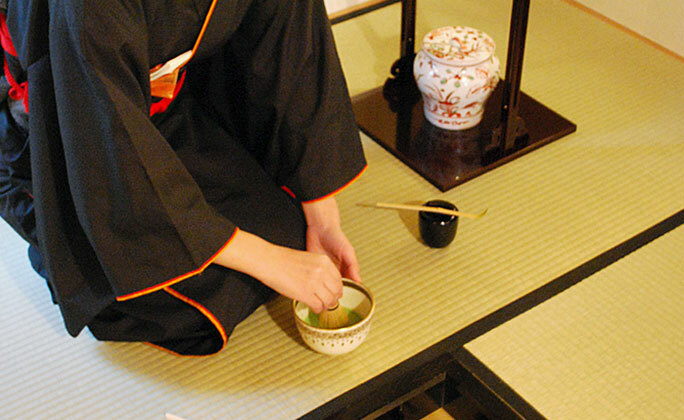 Their Kyoto flagship store has a real tea ceremony room where guests can learn how to enjoy matcha, as well as the manners required for the occasion. The matcha experience takes approx. 30 minutes. Reservations for two or more people are prioritized. Guests can also make an original blend of tea on other floors. Moving to https://gc.synxis.com/ for Room Reservation.